The history of the Manin Cafè, which, overlooking our “Listòn” (Piazza dei Martiri), served to several generations of Belluno. From the middle of the nineteenth century the “Caffè Manin” had become the main gathering place of the belligerent bourgeoisie, where “everything is spoken, spreads out to everyone” (this was the “La Bolletta”, a humorous fifteenth directed by the League of Leva). But it was already at the beginning of the nineteenth century “as a coffee shop in Guernieri”. At that time it was called “Caffè Scopici”, which in 1842 the Venetian magazine “Il Gondoliere” was called “Pedrocchi di Belluno”, a coffee-symbol as the Florian in Piazza San Marco. Then became National in 1866 after the unification of Veneto to Italy, finally took the present name in honor of Venetian patriot Daniel Manin. The building, owned by Angelo Guernieri, journalist and publisher, was inherited by the Federici family who gave away the part where coffee was at Giuseppe Meneghini. We are in 1882 and coffee is restored. Valt worked in Lucerne in Switzerland in road works, so in 1894 he signed an agreement for managing with Alessandro Menegazzi of San Martino di Lupari. Valt left the room to his nephew Antonio Dell ‘Eva in 1894, who rented it in 1903 to two brothers in Treviso, Renzo and Romolo Olivotti. During the First World War (documented numerous vintage photographs) became the exclusive meeting of Austro-Hungarian officers with German-speaking staff. Despite the restorations that in the course of the twentieth century “hit” the coffee and the building now owned by the Cassa di Risparmio, the interior trim resisted at least the advent of woodwork, when the frenzy of modernity took over and made it more anonymous depriving him of the patina that the story had deposited on couches and armchairs. In the old photos, the furnishings and the spiral staircase that went up to the room where he played cards and billiards were well distinguished in the city’s memory, as well as dances and receptions organized by the Manin Circle. Over the decades, then, the Manin handled several times, with several managers and owners. The most recent passages of ownership saw the Manin sold to the company La Genzianella Srl of Aurora Dalle Sasse of Lentiai and Aldo Ghedina of Cortina and then in 1997 by Rovigest srl of Rodolfo Vittoria of Zoppè di Cadore, which however closed for problems financial. 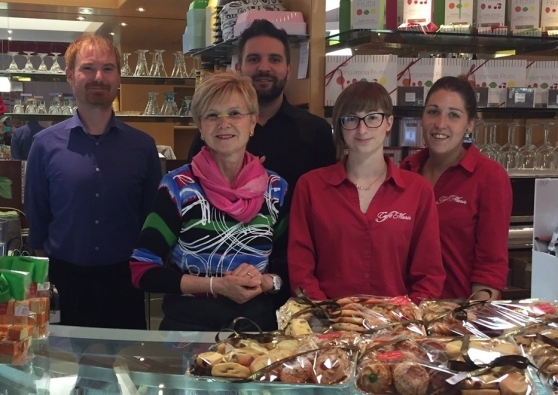 From 2010 to manage the refurbished Coffee there is Mirta Zanolla, a well-known person in Belluno, who has managed in recent years the tobacconist in Piazza Martiri, as well as other premises. The restaurant was acquired by “Segafredo Zanetti Worldwide Italia spa” (a company belonging to the Massimo Zanetti Beverage Group), which in turn entrusted management to Mirta, a well-known and highly regarded person in the business world of Belluno, a Bolognese company. The history of the Manin Cafe can be read in two precious books. The first one is “Piazza dei Martiri-Campedel”, edited by Ivano Alfarè, Stefano De Vecchi and Ferruccio Vendramini, published in 1993 on the initiative of the Municipality and the Jesuit (see in particular the essay by Giovanni Larese, “Centenary of workshops’). The second is “Tourism and Leisure in an Alpine City” by Ferruccio Vendramini, published in 2000 for the Bellunese Mountain Community. Four, writes Larese, were the historic houses located outside the old walled city: Deon and Manin in Campitello, Commerce in Piazza Vittorio Emanuele and Steam in Piazza Santo Stefano. Commerce opened in 1866 as Antonio Maresio Bazolle testifies in his “Annals of Belluno” for the initiative of the “coffee maker” Luigi Pedante. It appears in Bruno’s Guide to 1887 as “the city’s main cafe”. Vapore was instead opened in Palazzo Barpo in 1860 by Giuseppe Bortotti, near the place of stopping the diligence. As for the Manin, Larese writes: “The old Manin was a two-storey building with an elegant columned porch and five arches, preceded by a deep iron-style iron canopy.” That shed, now disappearing from the square, ended up embellishing the old Clizia villa in Mussoi.